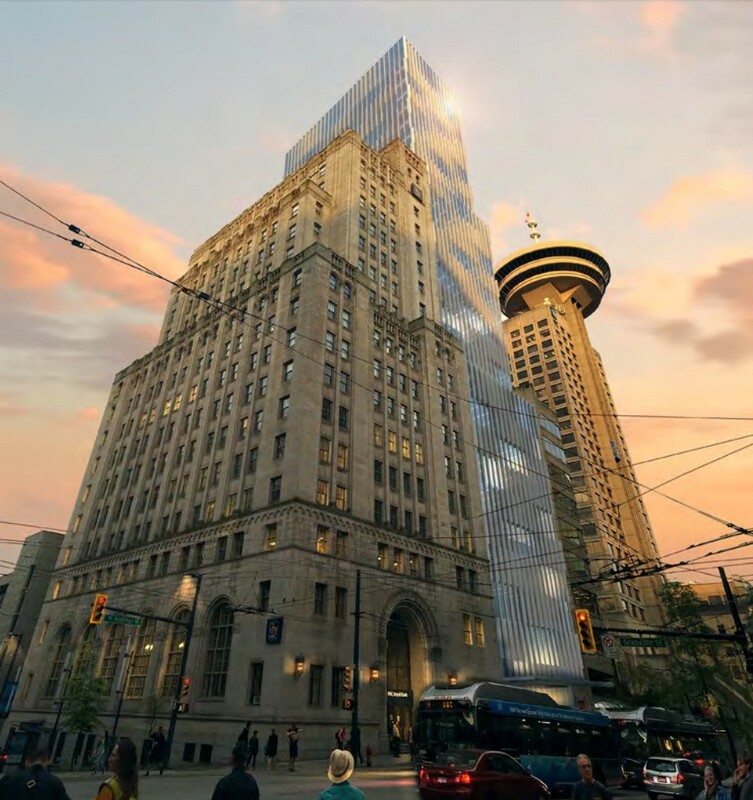 A new office tower project proposed for the 600 block of West Hastings Street in downtown Vancouver promises to be one of the most unique yet tastefully simple buildings in the city. 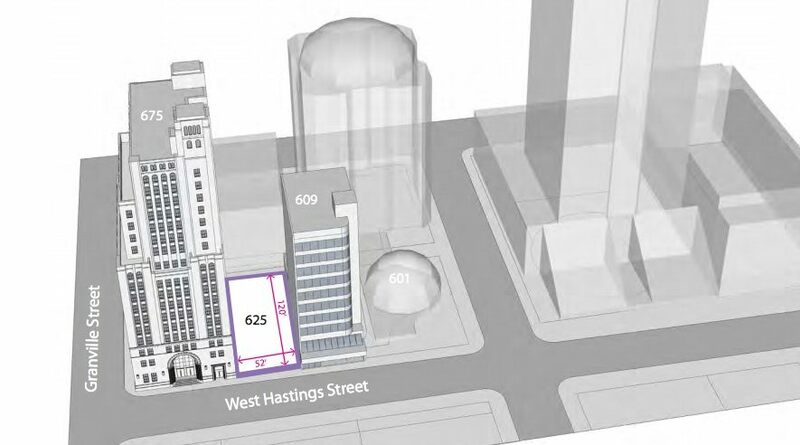 The City of Vancouver has received a rezoning application from Musson Cattell Mackey Partnership for 625 West Hastings Street, currently a ground-level parking space, that incorporates the 1930-built Royal Bank Building at 675 West Hastings. 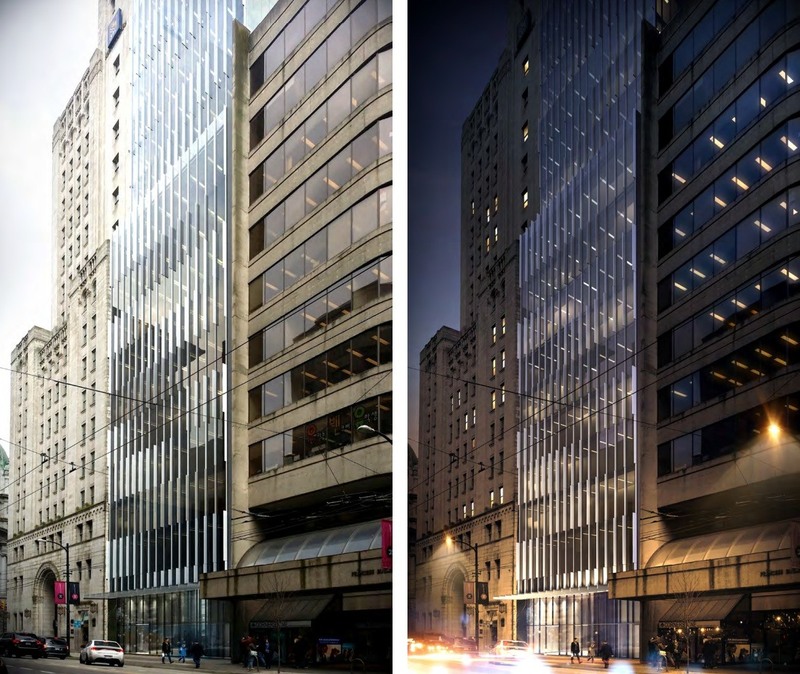 There are plans to build a 330-foot-tall, 28-storey office tower within the narrow 6,242-square-foot parking lot – a street front of just 120 feet – with a glass curtain wall and metal fin facade that mirrors the massing of the adjacent RBC Building. 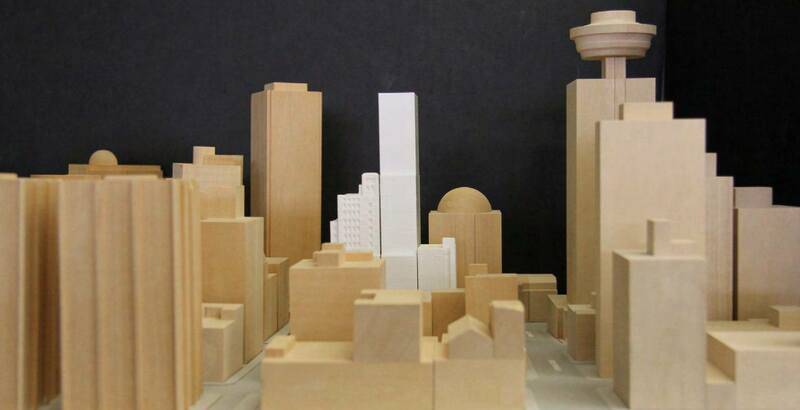 “The building massing concept aims to optimize the efficiency of a limited site area while accentuating a respectful response to the mass of the existing Royal Bank Building,”reads the architect’s design rationale. This will give the project a total floor area of 158,837 square feet and floor space ratio density of 25.5 FSR. A greater density could be engineered, but the site is vertically challenged due to restrictive view cones. 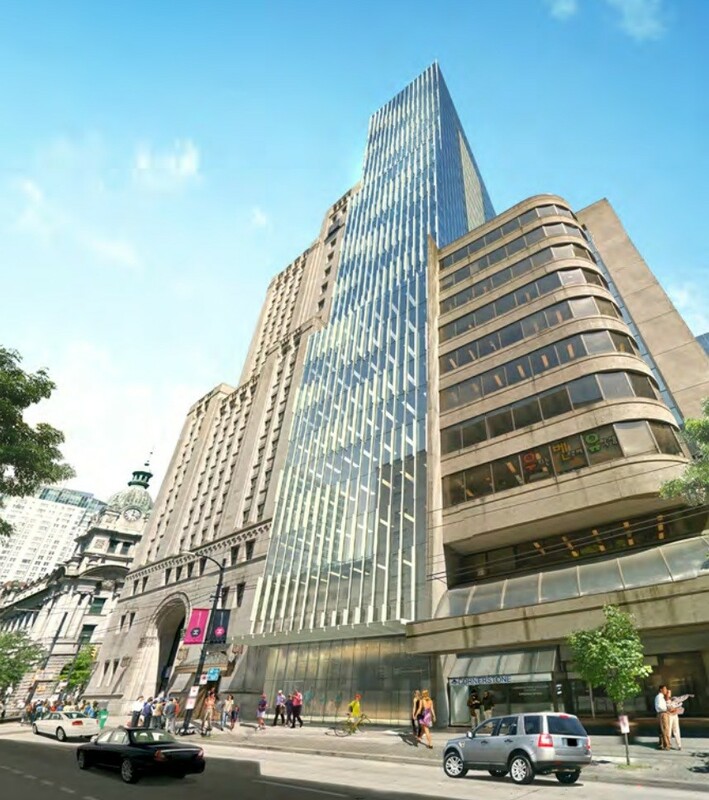 Unlike the nearby Old Stock Exchange office redevelopment, the floor plates of the old RBC building will not be opened up and integrated into the new adjacent tower to create large floor plates. However, there will be a shared ‘light well’ punctuated between the two buildings that will provide natural light and air for the office workers. Heliostat mirrors, on the rooftop of the RBC Building and on the west elevation of the new office tower, that will make precise movements to adjust its position according to the sun’s path will reflect light into this light well. 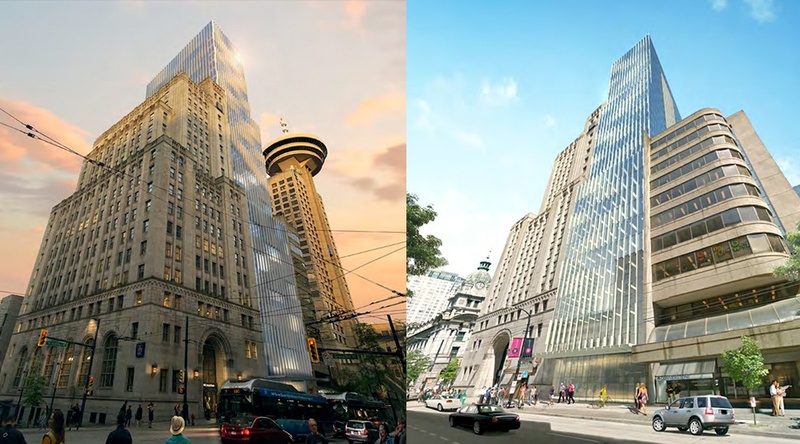 Both buildings will also share a lateral force resisting system, which will effectively provide a seismic upgrade to the RBC Building. This system combines concrete shear walls and cores, which use moment frame beams and a rooftop outrigger wall to provide the rigidity required for the narrow office tower’s slender concrete core. 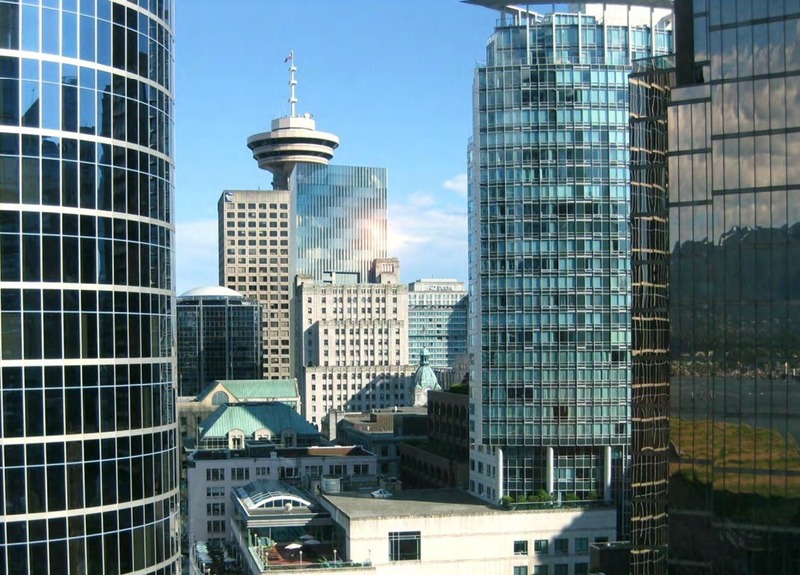 Proponents plan to achieve a LEED Gold environmental certification for the building through a high-performance envelope system that utilizes triple glazing, an efficient lighting system that uses occupancy sensors, extensive use of natural light, localized heating and cooling systems on each floor instead of a large central mechanical system, and a zero-waste operations system. The project has relatively minimal parking with just 67 vehicle parking spaces over five underground levels. As well, the exterior of the facade of the RBC Building will receive official heritage designation from the City following upgrades. 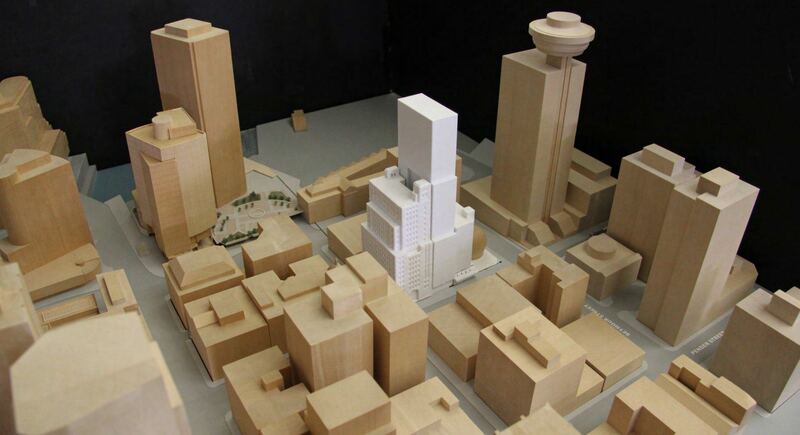 If approved, this will be the third new planned office tower for the downtown Vancouver city block framed by Granville Street to the west, West Cordova Street to the north, Seymour Street to the east, and West Hastings to the south. 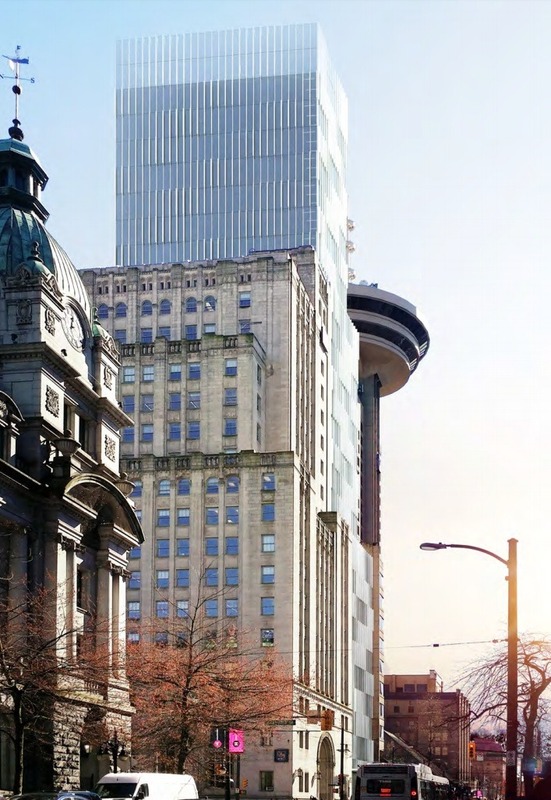 City Council previously approved a 25-storey office tower for 320 Granville Street that will replace the rickety-looking parkade, across the street from Waterfront Station, and a 25-storey office tower for 601 West Hastings that will replace the small, glass dome-covered plaza.